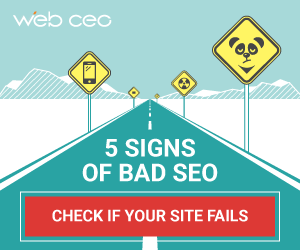 In order to increase conversion rate many Shopify store owners are facing with a bunch of problems. They don’t know usually how to interact with customers and how to inform them about future updates. That’s why many companies such as SpurIT started to think about In Stock Reminder App, which allows setup your campaign easily and without loss of time. So today we are going to review what In Stock Reminder can offer for store owners. After the installation you can see the main dashboard window with all available information and stats. It’s definitely requires your attention when it comes to your subscribed customers. 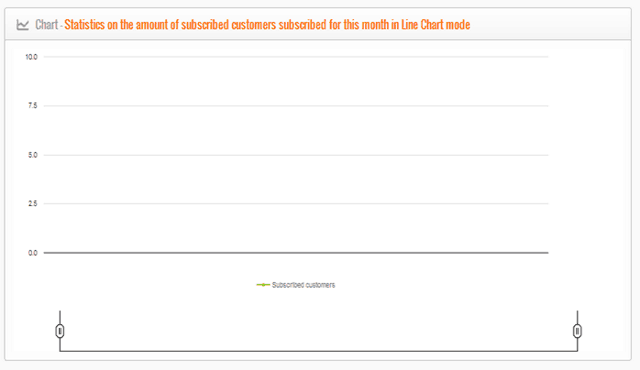 When you click on Line Chart or Column Chart you see Statistics on the amount of subscribed customers subscribed for the selected period in a Line/Column Chart mode. In Stock Reminder allows you to see the detailed info upon notifications, which means the list of notifications created by visitors of your store. 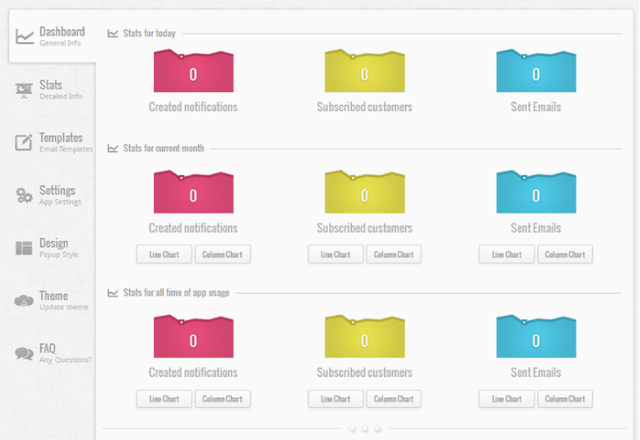 Subscribers tab demonstrates the list of customers who created notifications. Products tab demonstrates the list of products for which are created notifications by visitors of your store. 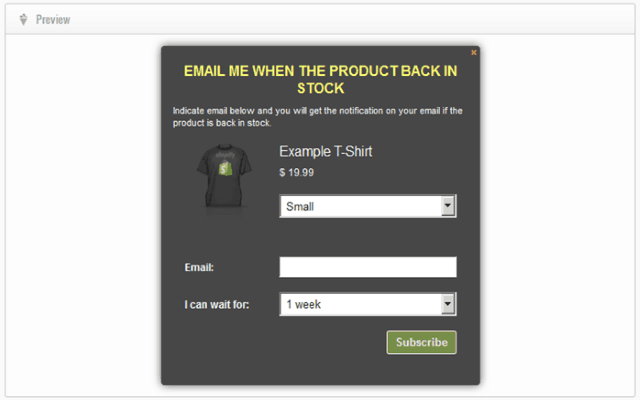 And Sent Emails tab shows the list of emails which were sent to your customers. It’s necessary to mention that we can export all data from these tabs to CSV file (Excel) for further analysis. 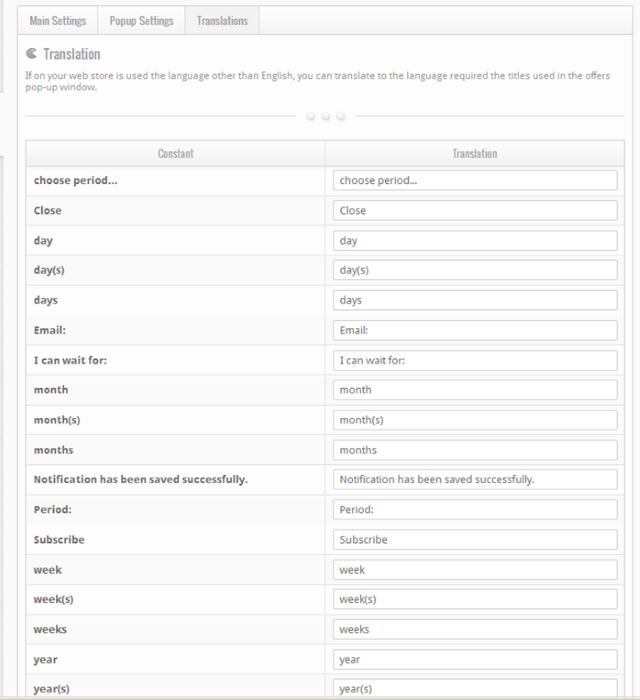 Email template allows you to create specific settings for users from various countries. 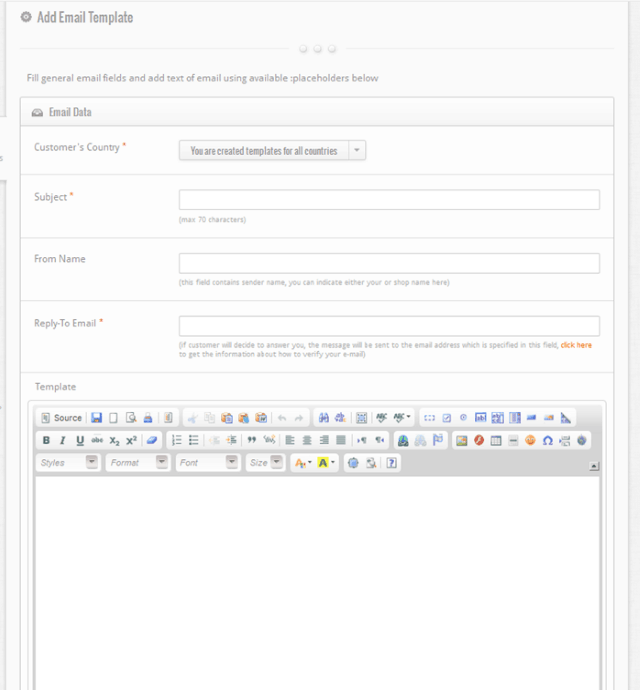 Client’s country template will be used to send emails. 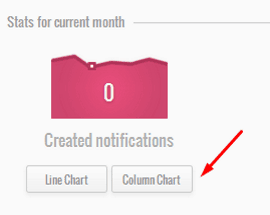 If the template for a certain country is not specified, the default template will be used for messages. 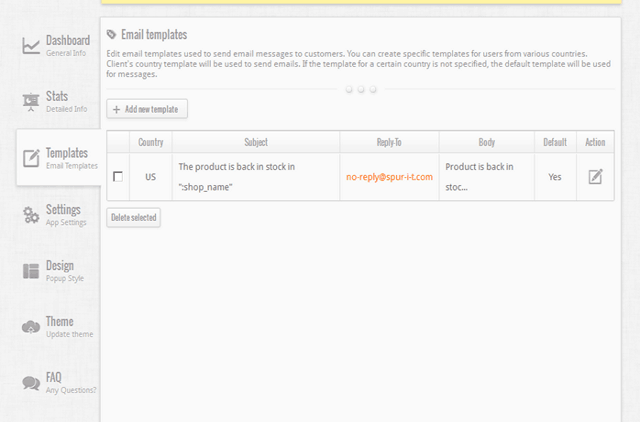 When you click Add New Template button you are able to fill in fields for your emails. And of course there is an option to test it before applying. Really powerful editor with all included functions allows you to customize your template, according to your needs. Settings category gives you an access to app configuration. There are bunch of options available for customization. 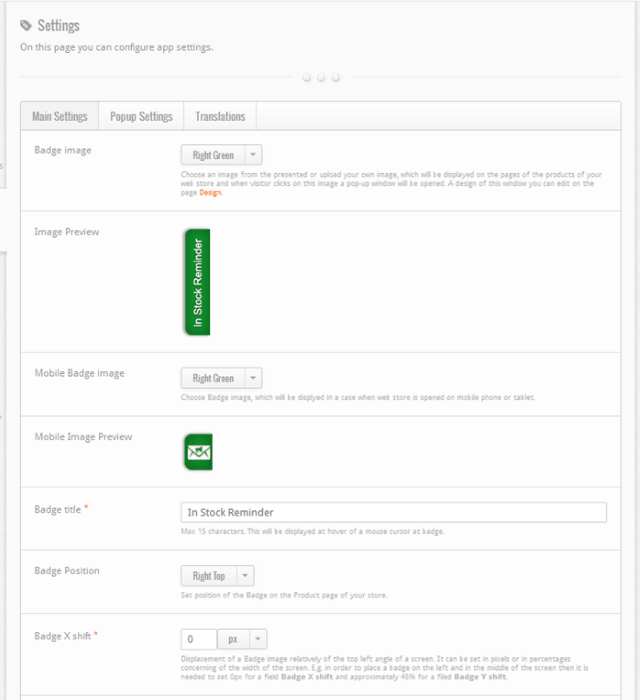 For instance, you can choose budge image (even upload your own), adjust mobile badge image and its color, set your badge title and its position. 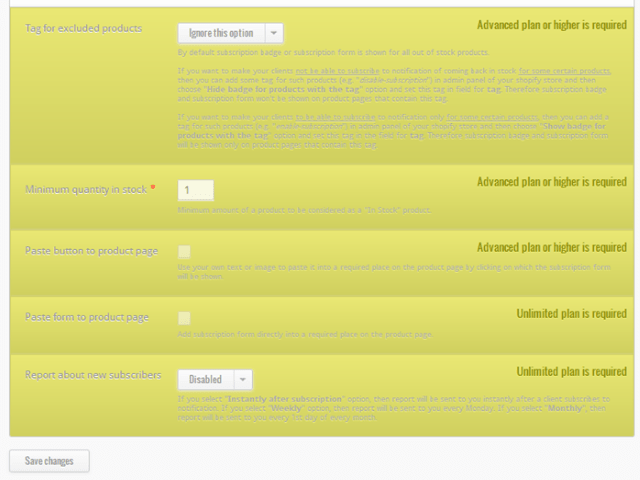 By default subscription badge or subscription form is shown for all out of stock products. If you want to make your clients not be able to subscribe to notification of coming back in stock for some certain products, then you can add some tag for such products. In Pop-up settings tab you can adjust your pop-up title, description, add or delete variants of values, which you would like to display in pop-up window for field «I can wait for». In Translation tab you can translate to the language required the titles used in the offers pop-up window if on your web store is used the language other than English. 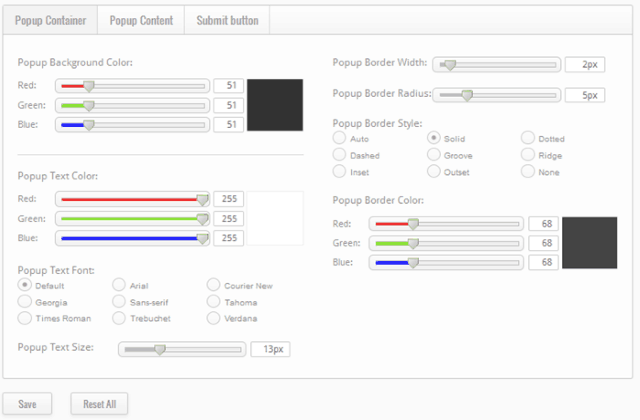 Design category allows you to setup your popup style, using simple and user friendly interface. Also you are able to see all changes in the real time. Other tabs like Popup Content and Submit Button are used for content adjustments and Subscribe button. Theme category is used for the following reason: if after app installation you change a theme for your web store, you will need to reinstall the app for your new theme. To do that, you just need to push the Start updating button. It’s really useful app for your Shopify store. If you are looking how to inform your users and motivate them to purchase products after they will be available in stock. Tons of adjustments and nice design: what else you need? In Stock Reminder by SpurIT Company is another example of must-have apps to increase your conversion rate.